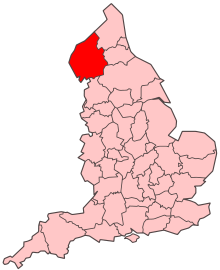 Location of Cumbria within England. The Cumbrian dialect is a local Northern English dialect spoken in Cumbria and surrounding northern England, not to be confused with the extinct Celtic language Cumbric that used to be spoken in Cumbria. As in any county, there is a gradual drift in accent towards its neighbours. Barrow-in-Furness (within the historic boundaries of Lancashire) has a similar accent to much of Lancashire whilst the northern parts of Cumbria have a more North-East English sound to them. Whilst clearly being an English accent approximately between Lancashire and the North-East, it shares much vocabulary with Scots. 'Cumbrian' here refers both to Cumbria and also to Cumberland, the historic county which, along with Westmorland, has formed the bulk of Cumbria since the enactment of local government re-organisation in 1974. There is a Cumbrian Dictionary of Dialect, Tradition and Folklore, which was written by William Rollinson, but is much harder to find a copy of than the respective dictionaries for Lancashire and Yorkshire. There is, however, a more contemporary and lighthearted "Cumbrian Dictionary and Phrase Book" available based on the long running online GonMad Cumbrian Dictionary (See #External links). Much of the vocabulary listed here is modern slang and not Cumbrian dialect. Despite the modern county being created only in 1974 from the counties of Cumberland, Westmorland and north Lancashire and parts of Yorkshire, Cumbria is an ancient land. Before the arrival of the Romans the area was the home of the Carvetii tribe, which was later assimilated to the larger Brigantes tribe. These people would have spoken Brythonic, which developed into Old Welsh, but around the 5th century AD, when Cumbria was the centre of the kingdom of Rheged, the language spoken in northern England and southern Scotland from Lancashire and Yorkshire to Strathclyde had developed into a dialect of Brythonic known as Cumbric (the scarcity of linguistic evidence, however, means that Cumbric's distinctness from Old Welsh is more deduced than proven). Remnants of Brythonic and Cumbric are most often seen in place names, in elements such as caer 'fort' as in Carlisle, pen 'hill' as in Penrith and craig 'crag, rock' as in High Crag. The most well known Celtic element in Cumbrian dialect is the sheep counting numerals which are still used in various forms by shepherds throughout the area, and apparently for knitting. The word 'Yan' (meaning 'one'), for example, is prevalent throughout Cumbria and is still often used, especially by non-speakers of 'received pronunciation' and children, e.g. "That yan owr there," or "Can I have yan of those?" The Northern subject rule may be attributable to Celtic Influence. Before the 8th century AD Cumbria was annexed to English Northumbria and Old English began to be spoken in parts, although evidence suggests Cumbric survived in central regions in some form until the 11th century. A far stronger influence on the modern dialect was Old Norse, spoken by Norwegian settlers who probably arrived in Cumbria in the 10th century via Ireland and the Isle of Man. The majority of Cumbrian place names are of Norse origin, including Ulverston from Ulfrs tun ('Ulfr's farmstead'), Kendal from Kent dalr ('valley of the River Kent') and Elterwater from eltr vatn ('swan lake'). Many of the traditional dialect words are also remnants of Norse settlement, including beck (bekkr, 'stream'), laik (leik, 'to play'), lowp (hlaupa, 'to jump') and glisky (gliskr, 'shimmering'). Old Norse seems to have survived in Cumbria until fairly late. A 12th century inscription found at Loppergarth in Furness bears a curious mixture of Old English and Norse, showing that the language was still felt in the south of the county at this time, and would probably have hung on in the fells and dales (both Norse words) until later. Once Cumbrians had assimilated to speaking English, there were few further influences on the dialect. In the Middle Ages, much of Cumbria frequently swapped hands between England and Scotland but this had little effect on the language used. In the nineteenth century miners from Cornwall and Wales began relocating to Cumbria to take advantage of the work offered by new iron ore, copper and wadd mines but whilst they seem to have affected some local accents (notably Barrow-in-Furness) they don't seem to have contributed much to the vocabulary. One of the lasting characteristics still found in the local dialect of Cumbria today is an inclination to drop vowels, especially in relation to the word "the" which is frequently abbreviated. Unlike the Lancashire dialect, where 'the' is abbreviated to 'th', in Cumbrian (as in Yorkshire) the sound is harder like the letter '?' or simply a 't' and in sentences sounds as if it is attached to the previous word, for example "int" instead of "in the" "ont" instead of "on the". Cumbria is a large area with several relatively isolated districts, so there is quite a large variation in accent, especially between north and south or the coastal towns. There are some uniform features that should be taken into account when pronouncing dialect words. The pronunciation of moor and poor is a traditional feature of Received Pronunciation but is now associated with some old-fashioned speakers. It is generally more common in the north of England than in the south. The words cure, pure, sure may be pronounced with a triphthong [ɪuə]. <g> and <k> have a tendency to be dropped or unreleased in the coda (word- or syllable-finally). <h> is realised in various ways throughout the county. When William Barrow Kendall wrote his Furness Wordbook in 1867, he wrote that <h> 'should never be dropped', suggesting the practice had already become conspicuous. It seems the elision of both <h> and <t> began in the industrial towns and slowly spread out. In the south, it is now very common. <l> in the word final position may be dropped or realised as [w]: woo wool [ˈwəw]; pow pole [ˈpɒw]. <r> is realised as [ɾ] following consonants and in word-initial position but is often elided in the coda, unless a following word begins with a vowel: ross [ˈɾɒs]; gimmer [ˈɡɪmə]; gimmer hogg [ˈɡɪməˈɾɒɡ]. <t> is traditionally always pronounced as a voiceless alveolar plosive, although in many places it has been replaced by the glottal stop [ʔ] now common throughout Britain. <y> may be consonantal [j] as in yam home [ˈjam]. As the adjectival or adverbial suffix -y it may be [j] or [iː] as in clarty (muddy) [ˈklaːtɪ]. Medially and, in some cases, finally it is [ɐː] as in Thorfinsty (a place) [ˈθɔːfɪnstɐː]. Finally, in some parts of the county, there is a tendency to palatalize the consonant cluster <cl> in word-initial and medial position, thereby rendering it as something more closely approaching [tl]. As a result, some speakers pronounce clarty (muddy) as [ˈtlaːtɪ], "clean" as [ˈtliːn], and in some cases "likely" and "lightly" are almost indistinguishable. Stress is usually placed on the initial syllable: yakeren acorn [ˈjakɜɾən]. Unstressed initial vowels are usually fully realised, whilst those in final syllables are usually reduced to schwa [ə]. aboot About - similar to Canadian "aboat". yon used when indicating a place or object that is usually in sight but far away. abbreviation of yonder. biddies fleas or head lice or old people "old biddies"
crack gossip "ow marra get some better crack"
mockin or kack faeces / turd "I need to have a mockin"
clout/cluwt hit "al clout ya yan"
jam eater used in Whitehaven to describe someone from Workington, and vice versa. whure ye from? Where are you from? wha ya de'yan? What are you doing? Barrow-in-Furness is unique within Cumbria and the local dialect tends to be more Lancashire orientated. Like Liverpool this is down to the large numbers of settlers from various regions (including predominantly Scotland, elsewhere in England and Ireland amongst other locations). In general the Barrovian dialect tends to drop certain letters (including h and t) for example holiday could be pronounced as 'oliday, and with the drop of the h there is more emphasis on the letter o. Another example is with the letter t where twenty is often pronounced twen'y (again an emphasis on the n could occur). The Cumbrian numbers, often called 'sheep counting numerals' because of their (declining) use by shepherds to this very day, show clear signs that they may well have their origins in Cumbric. The table below shows the variation of the numbers throughout Cumbria, as well as the relevant cognate in Welsh, Cornish and Breton, which are the three geographically closest British languages to Cumbric, for comparison. NB: when these numerals were used for counting sheep, reputedly, the shepherd would count to fifteen or twenty and then move a small stone from one of his pockets to the other before beginning again, thus keeping score. Numbers eleven, twelve etc. would have been 'yandick, taendick', while sixteen and seventeen would have been 'yan-bumfit, tyan-bumfit' etc. Although yan is still widely used, wan is starting to creep into some sociolects of the area. There were several among the well-educated in the 18th century who used dialect in their poetry. One of the earliest was the Rev. Josiah Relph, whose imitations of Theocritan Pastorals self-consciously introduce the demotic for local colour. Although written about 1735, they were not published until after the author’s death in A Miscellany of Poems (Wigton, 1747), followed by two further editions in 1797 and 1805. The Rev. Robert Nelson followed him in the same tradition with A choice collection of poems in Cumberland dialect (Sunderland, 1780). Ewan Clark, a contemporary of Nelson’s, also wrote a handful of dialect imitations that were included in his Miscellaneous Poems (Whitehaven 1779). Female members of the gentry writing in dialect at this time included Susanna Blamire and her companion Catherine Gilpin. Miss Blamire had written songs in Scots that were set to music by Joseph Haydn. Her work in Cumbrian dialect was less well known and remained uncollected until the publication of The Muse of Cumberland in 1842. This was followed by Songs and Poems, edited by Sidney Gilpin in 1866, in which Miss Gilpin’s work also appeared. In the 19th century appeared a few poems in dialect in the Miscellaneous Poems of John Stagg (Workington, 1804, second edition the following year). Known as ‘the Cumbrian Minstrel’, he too wrote in Scots and these poems appeared in the new editions of his poems published from Wigton in 1807 and 1808. What seems to have lifted use of Cumbrian dialect from a passing curiosity to a demonstration of regional pride in the hands of labouring class poets was the vogue of Robert Burns, among whose disciples the calico worker Robert Anderson counted himself. His Ballads in the Cumberland Dialect were published from Carlisle in 1805 and were reprinted in several different formats over the following decades. Some of these publications also incorporated the work of his precursors and a few other contemporaries, such as Ewan Clark and Mark Lonsdale. One such collection was Ballads in the Cumberland dialect, chiefly by R. Anderson (1808, second edition 1815, Wigton), and a third from Carlisle in 1823. A more ambitious anthology of dialect verse, Dialogues, poems, songs, and ballads, by various writers, in the Westmoreland and Cumberland dialects, followed from London in 1839. This contained work by all the poets mentioned already, with the addition of some songs by John Rayson that were later to be included in his Miscellaneous Poems and Ballads (London, 1858). Another anthology of regional writing, Sidney Gilpin’s The Songs and Ballads of Cumberland (London, 1866), collects together work in both standard English and dialect by all the poets mentioned so far, as well as Border Ballads, poems by William Wordsworth and family, and other verse of regional interest. Some later poets include John Sewart (Rhymes in the Westmoreland Dialect, Settle, 1869) and Gwordie Greenup (the pseudonym of Stanley Martin), who published short collections in prose and verse during the 1860s and 1870s. A more recent anthology, Oor mak o' toak: an anthology of Lakeland dialect poems, 1747-1946, was published from Carlisle in 1946 by the Lakeland Dialect Society. ↑ "Who are the Jam-eaters". Whitehaven News. CN Group. 2008-10-02. Retrieved 2010-03-20. Thomas Farrall (1892). Betty Wilson's Cumberland Teals. Carlisle: J. C. Mason. Dan Gibson (2012). The GonMad Cumbrian Dictionary & Phrasebook. ISBN 1481095307.